Anyone who has been stuck in rush-hour traffic has fantasized about driving a tank and crushing everything in their path. Tony Borglum actually bought a tank. Then he bought another, and another. And he'll let you drive them. 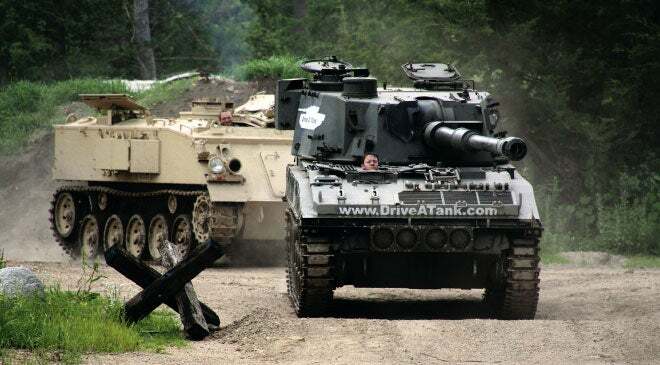 Borglum's Drive A Tank lets civilians pilot close to three dozen disarmed and decommissioned military vehicles, navigating through a series of combat scenarios that unfold across the company's sprawling Kasota, Minn., property, a long-abandoned stone quarry mined during the late 1800s. Patrons also can bear down on rusted-out automobiles and other detritus scattered across the 22-acre site, rolling the tanks over anything and everything they encounter. "We've crushed cars and motor homes. We've even driven tanks through barns on special occasions," Borglum says. "You name it, it's doable." Borglum--a heavy-equipment contractor by trade and lifelong motor-sports enthusiast--conceived Drive A Tank in 2006 after traveling to England to purchase a Ferret Scout Car, an armored vehicle optimized for reconnaissance missions. While there he spent a day at Northamptonshire-based Tanks-A-Lot, an off-road tank-driving course specializing in corporate events. The experience inspired him to bring the concept home to the States. Borglum launched his company in 2010. His armory now boasts a 60-ton Chieftain MK10 battle tank, an FV433 Abbot self-propelled gun and an FV432 armored personnel carrier, alongside a growing collection of historic and modern machine guns. The U.S. military does not surplus its tanks, so most of Drive A Tank's vehicles are British military surplus. While U.S. resellers and private collectors price tanks between $25,000 and $30,000, Borglum acquires most of his vehicles from overseas partners at a substantially lower cost. "You can buy one and import it for about $15,000 from the U.K.," he says. "Big equipment ships cheaper than small equipment. You can ship a 60-ton main battle tank for not that much more than a vehicle the size of a pickup truck, mainly because of the weight. Ships need a certain amount of ballast, so ocean freight is about $6,000. Trucking freight from Baltimore to my door is about $20,000." Don't shoot! Drive A Tank lets civilians man vehicles like an FV433 self-propelled "Abbot." Drive A Tank experiences start at $399 for the "3 Star Lt. General" package; the "5 Star Commander in Chief" option (which includes spins in a Russian T-55 MBT and three other tanks) is priced at $2,499. Drive A Tank averages 1,700 customers per year, buoyed by magazine ads targeting war-history buffs, as well as featured appearances on TV programs like History Channel's Only in America With Larry the Cable Guy and Discovery Channel's Wreckreation Nation. While most Drive A Tank visitors are tourists and bachelor parties, Borglum offers corporate team-building packages and has welcomed executives from firms ranging from automaker Audi to cleaning-solutions provider Tennant Company. Creighton Burrows, a global supply manager at Apple and self-described gearhead, received the Commander in Chief package as a surprise 40th birthday gift from his wife. In April he traveled from Cupertino, Calif., to Kasota. "It's the whole experience," Burrows says. "Driving the tanks isn't a 'hold back' type of deal--the T-55 is a manual transmission that utilizes a clutch for shifting. You're not just putting it into granny gear and going around in circles." Borglum says he will continue enhancing the Drive A Tank experience by adding infantry-inspired packages and other features. "At first I just thought it would be cool to bring tanks home to America and let people drive them," he says. "But now I'd like to create a kind of military Disneyland." Drive A Tank is a military buff's dream, offering patrons hands-on access to everything from decommissioned tanks to 5-ton infantry transport trucks to machine guns. But like any good field general, owner Tony Borglum is already plotting his next salvo: heavy-equipment adventure, which gives customers the chance to operate bulldozers, excavators and other big-kid toys in a safe, controlled environment. "My family has been in the construction business for three generations," Borglum says. "It only makes sense to expand into that [market]." But while Drive A Tank has the tank-adventure space to itself (at least in the U.S.), Borglum will face mounting competition if he launches a supersize construction playground. Here are some of the heavyweights. Extreme Sandbox, located about 80 miles northeast of Drive A Tank in Hastings, Minn., lets guests man the controls of Caterpillar excavators, bulldozers and skid steers. There's also a 1992 Pierce Lance Custom Pumper fire truck, which served the communities of Nutter Fort, W.Va., and Central Islip, N.Y., until it was retired in 2013. Grand Canyon Tour Company gives Las Vegas visitors a break from casinos with its "Dig This" experience, which lets them try their hand at digging up earth with bulldozers and excavators. The firm also offers other forms of grown-up imaginary play, including a "Bounty Hunter Experience." Earthwork Adventures in Golden, Colo., boasts a 7-acre site and an arsenal of excavators, loaders, bulldozers, skid steers and compactors from manufacturers like Caterpillar, Komatsu and Kubota. Visitors can navigate an obstacle course or play the Drop in the Bucket game, which tests their motor skills via the excavator joystick. --J.A.